Caroline Tahmassian is an associate in the Spivak Law Firm where she represents California employees on a wide variety of labor and employment cases, including wage and hour class actions, discrimination claims, and harassment claims. 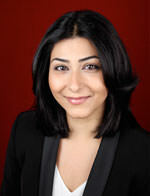 Ms. Tahmassian joined the Spivak Law Firm in February of 2013. She is a member of the California Employment Lawyers Associations. Ms. Tahmassian received her Bachelor’s degree in Computer Engineering from Azad University, Iran, in 2003. She received her Juris Doctor degree from Southwestern Law School in 2012. While in law school, Ms. Tahmassian served in the Children’s Rights Clinic as a student advocate where she represented students and their families in special education proceedings. She also served as a certified law clerk at the Los Angeles County District Attorney’s Office, Inglewood Juvenile Office. Ms. Tahmassian is admitted to practice in California state courts, as well as the United States District Court, Central and Southern Districts of California. She speaks Armenian and Farsi. Contact Caroline Tahmassian now for your free consultation.